Homage to Time: New Product Announcement! As audiophiles, we devote our time to contemplate and to feel the mystery of time's passage, to wonder, and to feel life. But all too often, our experience never exceeds that of a rare fleeting glimpse. Homage to Time is devoted to the continual transmission of wonder. It is devoted to the cherished prolonged moment that is music. Within this prolonged moment, as time's message evenly unfolds, our perception, too, unfolds. The signal merely carries the message through time. But as we receive the message, we find that we ourselves are carried through time. Now, together with the prolonged moment, we become truly involved. This product is therefore truly an Homage to Time. Three extraordinarily high performance cables make up the Homage to Time series. Pictured are: loudspeaker cable, RCA unbalanced signal cable, and XLR balanced signal cable. Performance of the loudspeaker cable can be enhanced to extraordinary levels by the use of LessLoss Firewall modules, connected to both ends of the loudspeaker cable. LessLoss provides flexible, 25 cm umbilical connectors for use with the Firewall modules and loudspeaker cable. Beginning at only 20 USD, these cost-effective umbilicals bring every bit of the quality from the amp to the Firewall module. At the other end of the main loudspeaker cable, they are used from a second Firewall module to the loudspeaker's binding posts. We are excited to make public this supreme performance cable at realistic pricing. You will be very happy with the exquisite performance this new product brings. Homage to Time loudspeaker cable is priced at only 150 USD/mono meter. Its modular combination of building blocks, including Firewall modules, means that every audiophile can find and easily exceed the price/performance ratio they are striving for. 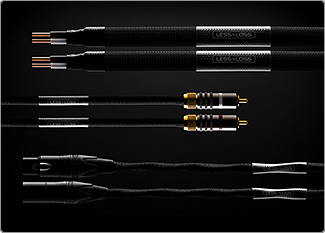 Click here to learn more about Homage to Time high performance signal and loudspeaker cable.